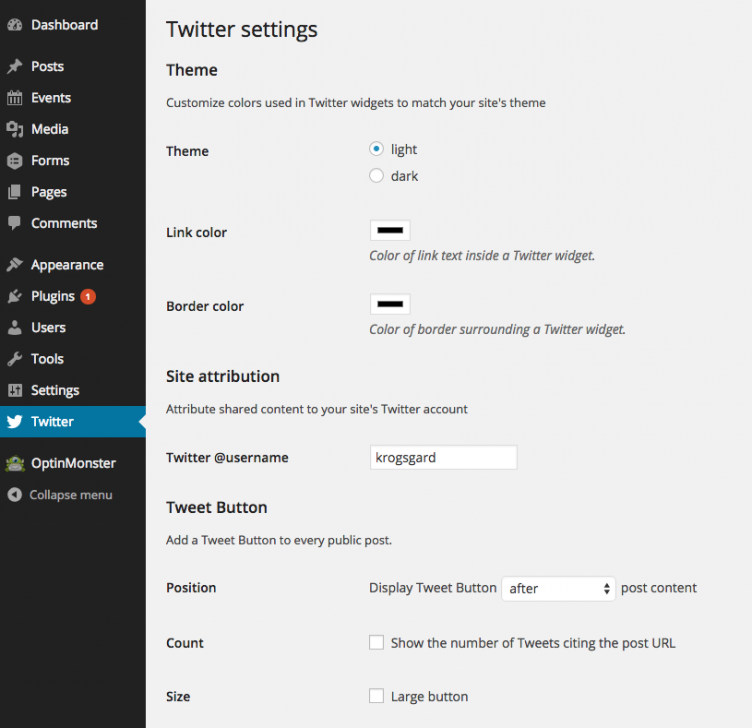 Twitter has finally announced an official WordPress plugin. It’s pretty thorough, and on a quick test run, works as advertised. Here’s a rundown of some of the features and background. “About time” is probably what comes to mind. 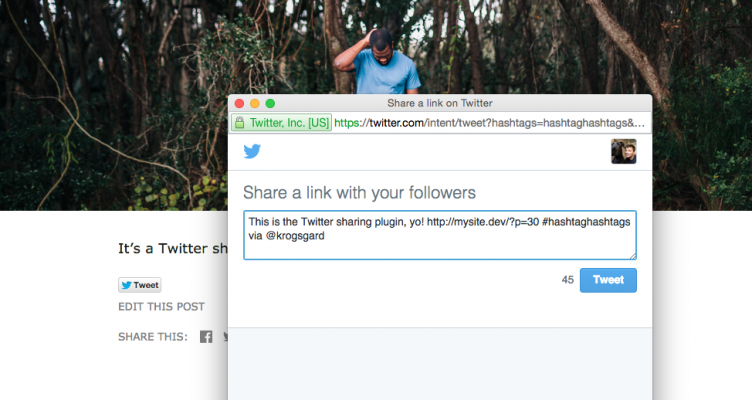 Twitter has announced an official WordPress plugin to support their platform. It’s available now on the WordPress plugin repo. I reached out to Otto to see how these decisions are made. Otto is one of the managers of the repo. A twitter representative emailed us, sent us the plugin, and asked to have the “twitter” name in the directory. We reviewed the plugin as per normal, found no issues with it, and decided to give them the name because, after all, they are indeed “Twitter” and have the rights to their own name. The previous plugin occupying that space had been inactive for a long period of time and had no real existing installations to speak of anymore. Additionally, the plugin had been closed for quite some time previous to that. Techcrunch, and likely others, are misreporting the plugin’s immediate popularity, as those numbers were largely from the previous iteration of the plugin. Twitter’s new plugin has a number of features, many of which have been implemented over the years by unofficial sources like Jetpack and Yoast. For one, they have released “official” Tweet and follow buttons, along with a settings page for basic configuration. Also, there’s a metabox on post edit that allows you to customize the predefined Tweet and Twitter cards, which is quite nice. They also have the ability to customize the colors for embedded tweets inside WordPress content. According to the Twitter blog announcement, there is also integration for Twitter ads and analytics tracking, which are both nice features for publishers. The one thing I notice is not in this plugin is any authentication feature. Perhaps it’ll come in the future, but right now you wouldn’t be able to auto-tweet new posts or perform other actions that would require Twitter Apps and authentication on a per-site basis. This is the type of functionality that Jetpack has long performed, using the WordPress.com authentication. I’m pretty happy to finally see an official Twitter plugin. The source code is on Github, and the plugin is released with the MIT license. At a very quick glance, it seems quite well done and I’m looking forward to playing with it some more. The Twitter plugin for WordPress requires PHP 5.4 or newer to take advantage of traits, late static bindings for extensibility, namespaces, and Twitter libraries. Embedded Tweets require a server capable of communicating with Twitter’s servers over TLS/SSL; the cURL library typically works best. Seems like this has the potential to frustrate a lot of users who are on shared hosting with older PHP versions. Frustration is a good thing in this regard. Hopefully it would cause users to complain to their host, or defect to better ones. Hey Josh! Hope all is well up north, we just got a ton of snow! Awesome! This makes me glad 🙂 …and its a great poke to get legacy hosts moving as clients migrate to pursue upgrades. To be fair, we made sure that they thought of that. The plugin fails gracefully on PHP < 5.4 installs. It doesn't exactly give the nicest response there, but it does return without breaking the site instead. So, on lower version hosting systems, it basically does nothing. There's surely room for improvement there, for example, to notify the user of the requirements, but for a first version, I think it's reasonable. This interests me more for the analytics and advertising parts. But I wonder if it adds unnecessary scripts to pages/posts where other features are not in use. Will have to test of course. Neat, was wondering where the sudden download spike was coming from.